His role in When We Rise: Gus Van Sant is the executive producer of When We Rise, and also directed the first episode. Where do I know him from? Gus Van Sant has directed all kinds of films you know, most notably Milk - the Harvey Milk biopic and Good Will Hunting - the film that launched Matt Damon and Ben Affleck to superstardom and won them their first Oscar. He's also the man behind Elephant - the indie film about a school shooting, as well as My Own Private Idaho and Drugstore Cowboy. Oh, and he also directed that remake of Psycho, but look, everyone makes mistakes. Dustin Lance Black and Gus Van Sant at Bing Theatre At LACMA on January 14, 2017 in Los Angeles, California. His role in When We Rise: Dustin Lance Black wrote all eight episodes of When We Rise, and directed two of them, also. Where do I know him from? Dustin Lance Black wrote the screenplay for Milk, which he won an Oscar for. He also wrote the screenplay for the Leonardo DiCaprio film J. Edgar. Alternately, maybe you remember him from the time he tweeted this to Sam Smith when Sam said he was the first openly gay man to win an Oscar. His role in When We Rise: Guy Pearce plays the older version of Cleve Jones, who's played by newcomer Austin P. Mackenzie in flashbacks. His character is based on the real Cleve Jones, an American AIDS and LGBT+ rights activist. Where do I know him from? Priscilla. You know him from Priscilla, Queen of the Desert. Aside from that, you probably also know him from any number of these films: Iron Man 3, Prometheus, The King's Speech, Animal Kingdom, The Road, The Hurt Locker, Memento, Factory Girl, and L.A. Confidential. Oh yes, sweeties, that's RESUME. His role in When We Rise: Michael Kenneth Williams is playing Ken Jones, a community organiser for the African-American community in San Francisco. Young Ken Jones is played by Jonathan Majors, and through Jones, we'll see the racial discrimination of gay bars in the 70s and 80s. Where do I know him from? You may recognise him from HBO's new hit The Night Of, The Wire, or perhaps Boardwalk Empire, which he was on between 2010 and 2014. He's also been in 12 Years a Slave, Gone Baby Gone, and The Road. So, oh yes, it's another resume of iconic titles. Her role in When We Rise: Rachel plays Diane, a nurse and social justice activist. In flashbacks, young Diane is played by Fiona Dourif, who was on True Blood with Carrie Preston in 2011. Where do I know her from? You know our Aussie gal from Muriel's Wedding, Cosi, Hilary and Jackie, and Blow, as well as Six Feet Under, Brothers and Sisters, and House Husbands. Actresses Rachel Griffiths (L) and Mary-Louise Parker of the television show 'When We Rise' pose in the Getty Images Portrait Studio. Her role in When We Rise: Mary Louise Parker is playing Roma Guy, a champion of women's rights who co-founded the San Francisco Women's Building. In flashbacks, young Roma Guy is played by Emily Skeggs. Where do I know her from? Weeds! MLP was the MVP of Weeds, playing our iconic antihero Nancy Botwin, the soccer mom turned drug dealer who just loved an iced coffee. Before that, though, she was in Angels in America and The West Wing, as well as Saved! and Red. 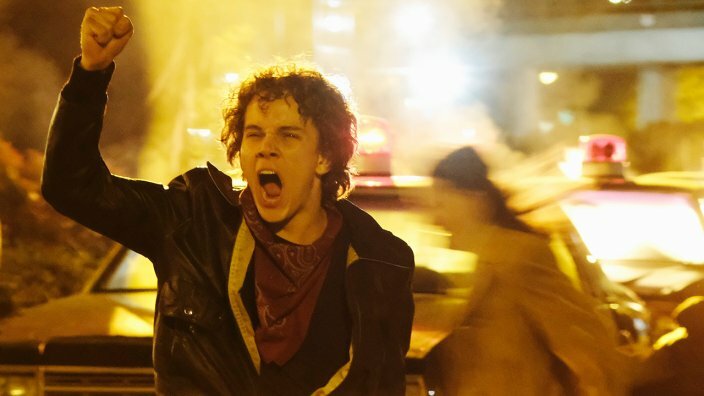 His role in When We Rise: T.R. Knight plays Chad Griffin in When We Rise. Chad Griffin is the president of the Human Rights Campaign, the USA's largest LGBT+ civil rights organisation. Where do I know him from? You probably recognise T.R. from Grey's Anatomy, or recall the headlines from when he left the show, after tabloids reported that Isaiah Washington called him a f----t during a fight with co-star Patrick Dempsey. Since then, T.R. has been on The Good Wife, 11.22.63, and Genius. Her role in When We Rise: Whoopi appears in one episode as Pat Norman, the first openly gay employee of the San Francisco Health Department. Where do I know her from? Where don't you know her from?! She's been in Sister Act. She's hosted the Oscars. She's on The View. She has her own line of medicinal marijuana in Los Angeles. Whoopi can - and does - do it all. Her role in When We Rise: Rosie plays Del Martin, one of the founders of America's first lesbian organisation. Where do I know her from? Well, she played the adult version of Roberta in Now and Then, one of the most iconic coming-of-age films of all time (don't @ me this is an undisputed FACT). More recently, she's been on The Fosters, as well as Curb Your Enthusiasm, Will & Grace, Drop Dead Diva and Web Therapy. She's also had a lot of Twitter fights with Donald Trump. Her role in When We Rise: Carrie plays Sally Gearhart, a teacher and sci-fi author, as well as an LGBT+ activist and feminist. Where do I know her from? Carrie's been on all your favourite shows. You know her from True Blood, you know her from The Good Wife, from The Following, and Persons of Interest. She was also in My Best Friend's Wedding, Doubt, and Vicky Cristina Barcelona.